What's Missing From Banking RC ? Will Hayne ask for more power and time? We think he should ... here's why. 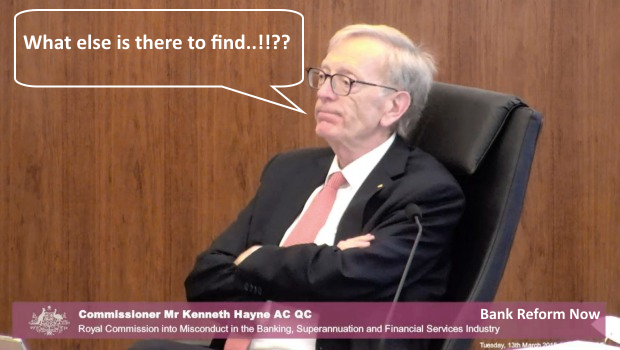 While the Hayne Royal Commission into banking and finance has uncovered some shocking misconduct it really has just scratched the surface. BRN wants a longer and stronger inquiry. Leon Ashby lists some critical areas that still require thorough investigation. 1) The Senate agreed (without it going to a vote), that the Banking Royal Commission should be extended in scope, time and resources. This concern should be recognised by Commissioner Hayne. 2) There are questions about the role of the banks in line with the constitution of Australia. These questions should be addressed by the Commissioner. At Parliament House on Tuesday the 14th August Senator Anning organised a meeting to highlight issues and cases that had not been looked at by the Royal Commission. Every Members and Senator was invited to attend - several did. These issues must be investigated by an extended RC. 3) The Royal Commission needs to look at the systematic forging of documents by banks, lawyers and other agents of the banks. The examples shown on the screen were bank employees forging loan agreements. Bank employees lying on affidavits which were swearing a customer signed loan agreements when the customer was documented to be 900 kms away at a dental surgery. Another case when the customer was overseas as evidenced by her passport. There were also bank lawyers forging documents of trusts that did not exist and stock transport documents saying cattle were HGP free (when they were not) which could put export markets at risk if the meat ended up in an HGP free consignment. The systemic forging of documents must be looked at by the Royal Commission. 4) The issue of depression and suicides was demonstrated when more than 50% of the approx 100 bank victims in the audience raised their hands to indicate they had been severely depressed and / or contemplated suicide as a consequence of the banks unjust actions. The Royal Commission has not looked at assisting the mental health of victims and compensation for the banks' responsibility for causing it. 5) Two La Trobe victims gave horrifying evidence of how La Trobe treated them. La Trobe has not been examined by the Royal Commission. There are potentially hundreds of La Trobe victims whose issues need investigation to find out how reasonable or not La Trobe is. 6) One victim gave evidence “ASK funding / Impact Capital” operates across three states and is involved with corrupt lawyers and former Victorian commissioner Stephen O'Bryan in writing false documents, forcing properties to be undersold to profiteers and bankrupting victims. This network of corrupt behaviour is likely to have thousands of victims and be systemic. The Royal Commission is yet to look at the issue and question anyone on it. 7) A Westpac customer gave evidence of how Westpac employees allowed $1.2 million of forged cheques to be payed out. The funds were never recovered, and the bank denies responsibility despite its employees not following the bank's processes. The family involved lost their $20 million business and family home leaving the family destitute, with no affordable justice and the bank not being fair. These sorts of internal bank fraud issues the Royal Commission has not looked at. 8) The defence invalid insurance scheme Comsuper is the only super scheme which escapes scrutiny from the Royal Commission, and evidence was given that it has several issues the inquiry should look at. 9) RHG / RAMS was another financial group which has destroyed families by acting unscrupulously. It too has escaped scrutiny so far. 10) The issue of banks not loaning funds / nor loaning funds in a timely way so farmers with a modest LVR can put in a crop during a good year is widespread. The nationwide actions of banks in this area needs looking at but they have escaped scrutiny up to now. 11) There was evidence given which showed at least one bank (ANZ) was guilty of offences under the Anti Money Laundering Act in not setting up trusts legally. The offences carry up to a ten year jail penalty. This could be extremely widespread and so far, the Royal Commission has not looked at it. 12) There was evidence by five hospitality businesses with LVR`s under 80% and still trading profitably, while not being in arrears, and which were not offered mediation by CBA / Bankwest. These businesses were deceived, bullied, and had their multi-million dollar business sold for not enough to realise any surplus funds and in one case the customer was sued for the shortfall the bank created. To date, the systemic problems with this bank have been overlooked by the Royal Commission. 13) There was evidence of Bendigo Adelaide bank (BAB) improperly and illegally taking over loans from Great Southern Financial Group after victims were signed up with the promise there was limited liability and no chance anyone would chase them for the money should the investment fail. The debts were moved over to the Bendigo bank just before GSF collapsed in a manner which may have been illegal. This resulted in some 20,000 victims having debts to Bendigo when there is no paperwork trail to show the loans were transferable but each victim has to pay a lawyer to win their case after they have nothing left. In one case the victim had a trauma payout and BAB claimed the payout and sent the victim bankrupt. Once again the Royal Commission is not looking at an issue which effects thousands of victims. This collusion between regulatory bodies extends right through the public service. Numerous people gave evidence of that, including one business man who has a report detailing over 100 instances of offences committed against his family by several different people within a number of public bodies. 15) Approximately ten people gave evidence of bank frauds and deceptions and bullying which caused them to end up with inflated interest costs and delaying tactics from the banks to ensure they defaulted on a payment. This was to ensure the victims farm or home or business would be sold by the banks. This combined with evidence from a former banker who explained the profit making abilities of the banks, and the evidence of another victim who forensically detailed the way funds were transferred between accounts to not only cause her to default and lose her properties, but to have hundreds of thousands of dollars disappear. This evidence is also ignored by the Royal Commission. 16) Approximately eight people gave evidence of the deceitful and destructive actions of receivers who raided their assets while charging exorbitant fees to sell up the victims' business. Once again this systemic corruption has been ignored by the Royal Commission. 17) The evidence of two victims who have evidence of corruption of Judges, a Police inspector and other police in breaking laws has also been ignored by the Royal Commission. Numerous victims allege these actions were widespread across Queensland. 18) The evidence of a victim who has uncovered how banks have separated the marriage of the debt to the title of a property (mortgage) and made it two separate agreements where banks legally (but immorally and illogically) have two unrelated agreements which strip customers of their rights without their knowledge. From there a bank has got the ability to sell up a person`s assets without ever discharging the debt. This has occurred with many victims and may have occurred with thousands of others. Once again this is evidence of systemic corruption by the banks, but which the Royal Commission is choosing to ignore. 19) Further evidence has come to light where the 1893 land transfer act in WA (prior to federation) has said (in section 111) that a value has to be written down as part of the terms of a mortgage and without those amounts, there is no debt owing on the property. In the securitized agreements that banks have with customers, that value is not included within their documents, therefore there are tens of thousands of agreements that no security exists for. In these cases properties have been sold up illegally with the banks having full knowledge of this illegal arrangement. We believe the Royal Commission needs to investigate this issue as well. 20) One bank victim was given (by a whistleblower) confidential bank documents on his case which shows 10 criminal charges could be laid against his bank. To date, he can not afford the cost of lawyers to obtain justice. Once again there is evidence that the Royal Commission should be looking much harder at many more victims' cases and extending the Royal Commission's powers and duration to do so. BRN Comments - The 14.08.18 Parliament House Bank Forum was a great success ... and a turning point. People came from right around the country to make sure that every politician knew just how much crime and corruption infested our banking system. The pollies all know .... and not one Senator dared to vote down the call for an extended and enhanced Royal Commission. See the resulting Bank Victims Horror Stories Series. Turnbull and his team have repeatedly said that if Commissioner Hayne asks .... he will get more power, time and resources. Sign the petition for an extended and more powerful Banking Royal Commission asking Hayne and the Governor General to respect the will of the people. We want an honest and effective finance system that serves our interests. To get one we need an honest and effective Royal Commission that serves the people ..... not one written by the bankers and for the bankers.